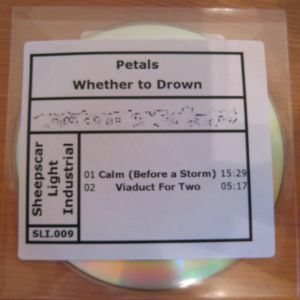 Leeds’ label du jour, Sheepscar Light Industrial, have just released a new batch of 3″ cdrs into the world. Aqua Dentata, Andy Jarvis and Petals have all had the industrial treatment: collect ’em all! You can buy the physical beauties, digital files and even stream ’em here. I have a wedge of Petals’ Whether to drown discs which can be purchased or traded with myself. Contact me at kevinjsanders@gmail.com. For fans of ecstatic synths and grumpy violins, creepy electronics and the future ghost of Rick Wakeman.